Wall Street expects a year-over-year increase in earnings on higher revenues when ManTech International (MANT) reports results for the quarter ended December 2018. While this widely-known consensus outlook is important in gauging the company’s earnings picture, a powerful factor that could impact its near-term stock price is how the actual results compare to these estimates. 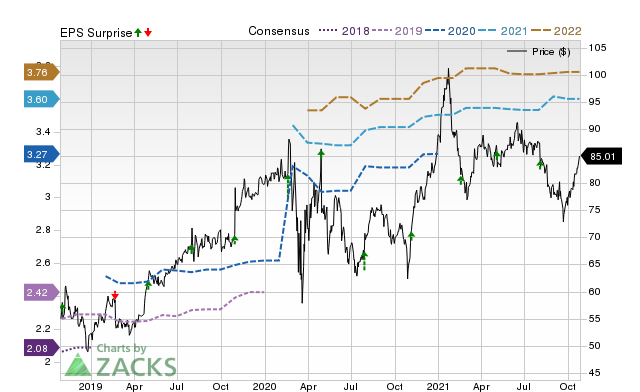 The stock might move higher if these key numbers top expectations in the upcoming earnings report, which is expected to be released on February 20. On the other hand, if they miss, the stock may move lower. While the sustainability of the immediate price change and future earnings expectations will mostly depend on management’s discussion of business conditions on the earnings call, it’s worth handicapping the probability of a positive EPS surprise. This defense contractor is expected to post quarterly earnings of $0.52 per share in its upcoming report, which represents a year-over-year change of +15.6%. Revenues are expected to be $497.64 million, up 7.7% from the year-ago quarter. Estimate revisions ahead of a company’s earnings release offer clues to the business conditions for the period whose results are coming out. Our proprietary surprise prediction model — the Zacks Earnings ESP (Expected Surprise Prediction) — has this insight at its core. Thus, a positive or negative Earnings ESP reading theoretically indicates the likely deviation of the actual earnings from the consensus estimate. However, the model’s predictive power is significant for positive ESP readings only. How Have the Numbers Shaped Up for ManTech? For ManTech, the Most Accurate Estimate is the same as the Zacks Consensus Estimate, suggesting that there are no recent analyst views which differ from what have been considered to derive the consensus estimate. This has resulted in an Earnings ESP of 0%. So, this combination makes it difficult to conclusively predict that ManTech will beat the consensus EPS estimate. Analysts often consider to what extent a company has been able to match consensus estimates in the past while calculating their estimates for its future earnings. So, it’s worth taking a look at the surprise history for gauging its influence on the upcoming number. For the last reported quarter, it was expected that ManTech would post earnings of $0.52 per share when it actually produced earnings of $0.55, delivering a surprise of +5.77%. Over the last four quarters, the company has beaten consensus EPS estimates three times. That said, betting on stocks that are expected to beat earnings expectations does increase the odds of success. This is why it’s worth checking a company’s Earnings ESP and Zacks Rank ahead of its quarterly release. Make sure to utilize our Earnings ESP Filter to uncover the best stocks to buy or sell before they’ve reported. ManTech doesn’t appear a compelling earnings-beat candidate. However, investors should pay attention to other factors too for betting on this stock or staying away from it ahead of its earnings release.